Can-Am Spyder F3-S E Concept e-trike the next step? Home » Bikes » Can-Am Spyder F3-S E Concept e-trike the next step? Having seen the recent release of the Can-Am Spyder F3-S with sport mode recently, here’s another take on the trike concept, this time powered by batteries. The Can-Am Spyder F3-S E Concept was created and built by BRP’s Centre de Technologies Avancées (CTA), in collaboration with the Sherbrooke University in Quebec, Canada. This concept takes the Can-Am Spyder and replaces the Rotax three-cylinder mill with a battery pack that stores 16 kWh of power, which is claimed to give 170 km of range. According to an Autoevolution report, the electric motor coupled to the battery pack gives 67 hp and 200 Nm of torque. Considering that the torque comes on from standstill in an electric vehicle, this makes for very entertaining performance from the 6,500 rpm liquid-cooled electric motor. The Can-Am Spyder F3-S E Concept was funded at a cost of 10.1 million euro (RM45.2 million) by CTA, and more than 20 students from the university contributed their time and effort for the project, which began in 2010. While Can-Am Spyder trikes remain very much a niche-market product, the time for e-bikes entering the mass-market and being treated as part of the automotive landscape is rapidly approaching. While there is no further information on the Can-Am Spyder F3-S E Concept, or whether it will reach the consumer, it seems to look that way. 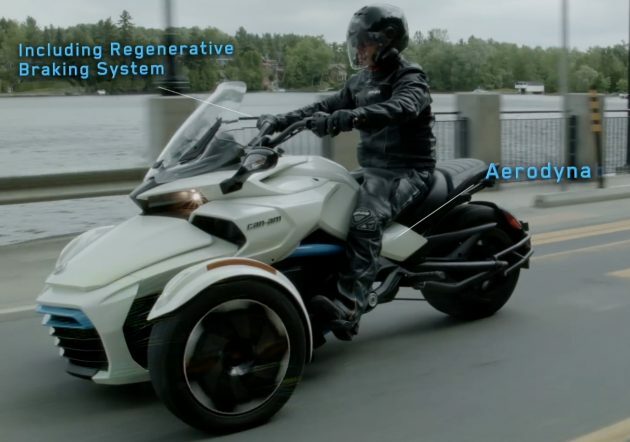 Certainly an electric-powered trike like the Can-Am Spyder will offer more space and load-carrying capacity for battery packs, the traditional drawbacks to e-bikes which limits their power and range. What do you think? Would you see an e-trike replacing the car as transport for the individual? Leave a comment with your thoughts and opinions below. I would think price would be above most peoples price affordability. They still are today. Replacing car as common mode of individual transport? No sure elsewhere but more likely would not happen here in our sunny@hot with constant heavy shower. People still prefer roof over their head. Who gonna buy this?cannot celah2 during jem….better take kapchai…..